The BIG Question: Which Is Your Favourite Goal From 25 Years Of Premier League Football? Pies feel obliged to admit at this juncture that we’ve never really felt any special admiration for Dennis Bergkamp’s goal against Newcastle in 2002: your newly-crowned ‘Best Goal in the History of the Premier League‘. 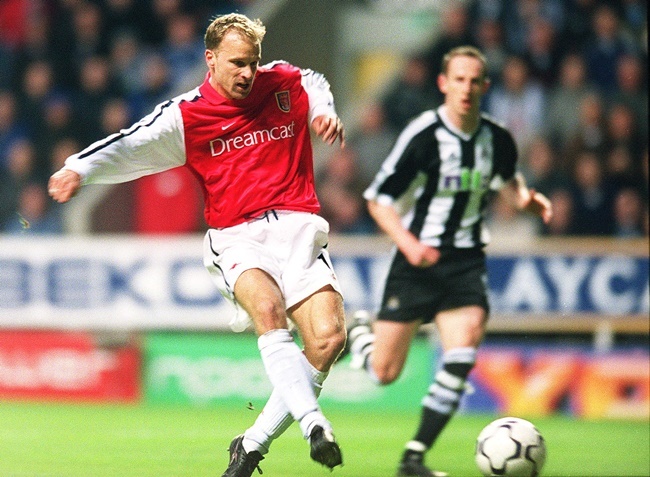 It’s a nice enough goal, sure – the turn is clinical, the touch superb, etc – but as far as we’re concerned (not very, truth be told) it’s not even top-three material when it comes to Bergkamp’s personal highlight reel. So, we thought we’d open up the floor to the Pies faithful, to see if any of you are of a like mind. Perfectly perfect. Nobody could strike a ball more purely. You don’t need a good first touch if your first-time finishing is that surgical! Primarily remembered a stout, physical striker who scored hundreds of goals by kicking things very hard, it’s perhaps easy to overlook the incredible ability and range Shearer had as an out-and-out No.9. In fact, there’s a strong argument for him being the most underrated player in Premier League history, but that’s a different debate for a different day. Anyway Pies fans, care to present us with your favourite goals from the past quarter-century of English top-flight football? @Beano: Shout. Love the trajectory of the bend, so to speak. @Bert: Beautiful goal, sadly not recreated during his near-featureless subsequent stint at Forest. Partial to a diving header but can’t think of any off the top of my head! @Conor: Have dim memories of Juninho scoring a really smart diving header for Boro (1996/97) and still getting a bollocking off Fabrizio Ravenelli for not letting him score. I’m partial to Cantona against Sunderland in 96. Started by looking a dribble to nowhere, then he gets past the midfielders around him and after a 1-2 pass, places a perfect chip right on the top corner followed by that celebration. @Shipper: THAT… WAS A GOAL!! I know he’s a bellend, but Paolo’s volley was poetry. Good strike, but a better keeper would’ve saved it. Because it wasn’t a fluke, he simply was THAT good during that season. He scored four goals in that game btw. Perhaps barr DiCanio’s, none of the rest are as good as Bergkamp’s. Shearer’s is good but it is boring! It’s not a rocket, it just boings off his foot…….Dull. I am disturbed by the lack of love for one of Zola’s little feats of artistry! I’ve only been following the PL (and supporting Everton) from across the pond since 2011, but I love the absolute belter from Jags in the Merseyside Derby. It’s impossible to choose only one but that goal from Bergkamp is one of my favourites. It’s just too much class. I mean, I think you’re born with that movement, it was just so natural and simple but not in the sense that you can do it yourself. It’s like a Beatles song, very simple and easy but nobody can write one. Sulley Muntari scored a few crackers with his left peg, as I remember (2 in one game against villa IIRC). Best goal has to be Giroud’s Scorpion kick from last season, though. How has NOBODY mentioned Matthew Le Tissier? !